We’ve made getting involved in Student Volunteer Week super easy. Here you’ll find everything you need to promote your event and celebrate #SVW2019! This is our RESOURCE GUIDE for your benefit. Our focus in 2019 is Kaitiakitanga, the guardianship of our environment. Student volunteers are instrumental to this guardianship, and are at the forefront of advocating for environmental protection and carbon neutrality. Throughout the week, universities, schools, and organisations nationwide will host a variety of events celebrating and connecting young people with opportunities to get involved. 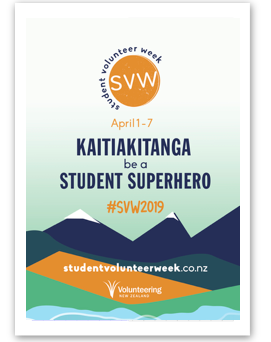 Student Volunteer Week, 1-7 April 2019, celebrates and recognises the contributions of students in our communities. Young people are stepping up and taking on some of the most important issues our world has ever seen. #SVW2019 values and amplifies the voice of these students in the social change they are leading and contributing to. The contributions of these young people in Aotearoa New Zealand are nothing short of heroic. 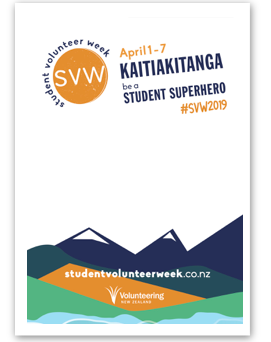 During Student Volunteer Week we celebrate the amazing mahi of our Student Superheroes in all areas of volunteering, and work to grow and develop the student volunteer movement. 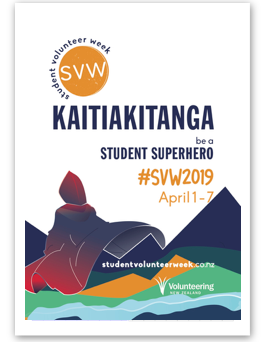 Kaitiakitanga, the guardianship of nature, is this year’s campaign theme. Student volunteers are at the forefront of key movements, such as advocating for the carbon neutral future needed to safeguard our planet. 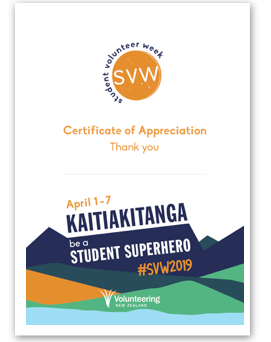 By celebrating Kaitiakitanga, we hope to raise awareness of environmental issues and celebrate the students working to ensure a healthy and livable planet for years to come. 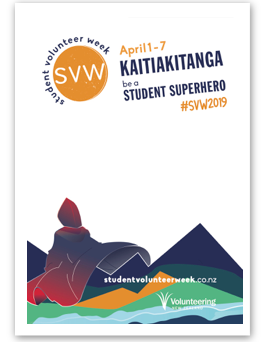 Throughout Student Volunteer Week, universities and schools nationwide will host a variety of events to celebrate our student superheroes, and connect young people with opportunities to get involved in volunteering. 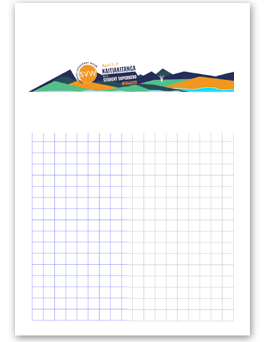 We’ve got a series of logos to use when promoting SVW2019. For colour and font details, please see our resource guide. Each poster has space for you to add your own logo. You can use the ‘Blank Poster’ to add more details. We have a variety of graphics for you to use across your social media platforms. Please contact us if you’d like some advice. Check out our digital photo frame on Facebook! 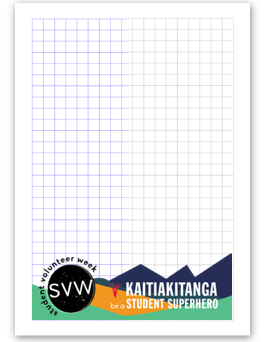 Show appreciation for your student volunteers with our certificates!